Full size (4/4) violins from Gliga, Primavera, Hidersine and others, carefully selected for quality and good value for money. Violins that are available for rental have a rental button alongside. Before you decide to rent please read our terms and conditions on the rental page. Primavera 200 violin outfit. This is the model that won the Best Value Bowed Instrument at the Musical Industries Awards a few years ago. Since then it has been improved with a new Carbon Composite Bow, a new case with a more student proof handle and reflective strips, making it really stand out in vehicle headlights. A useful safety feature. Still made from well selected, hand carved tone woods with Ebony fittings this is an excellent student outfit and one of our best sellers. 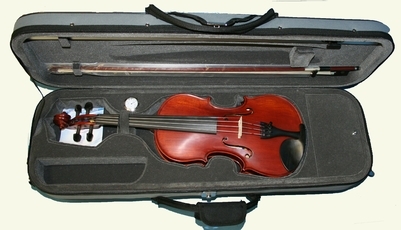 Hidersine Vivente Student violin outfit. This violin has just won the MIA award for the best value violin this year. A nicely made student instrument. Comes complete with a Brazilwood bow and rosin in a lightweight oblong case. Exceptional value for money from a well respected string supplier. The Primavera Loreato is the top of the Primavera range. Finer craftsmanship, better quality maple, spruce and ebony produce a superior student violin. Comes with a stylish oblong case and a good quality Carbon Composite bow. Suitable up to grade 5, maybe more. An improved version of one of our best selling violin outfits, the Primavera Loreato. Fitted with Corelli Crystal strings and with a much improved setup in our workshop. This gets the best out of an already good violin and produces a student outfit that is superb value for money. Gliga Genial 1 Violin Outfit. Made in Romania from European tonewoods. Fitted with Corelli Crystal Synthetic cored strings and comes with a good quality dart shaped case, an octagonal Brazilwood bow and a Hidersine Rosin. 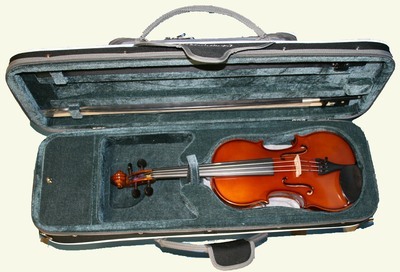 A lovely mellow student violin at a competitive price. A lovely violin outfit from Eastman Strings. 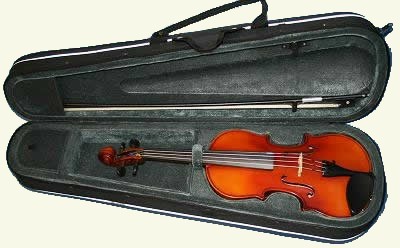 Fitted, by us, with Dominant strings, this is an excellent instrument for students looking for a good medium priced outfit that will take them to the higher grades. Comes with a superior plywood cored dart shaped case, a good quality octagonal brazilwood bow and a Hidersine 3V Rosin. Gliga Gems II Outfit. Good quality Romanian Violin using European tonewoods. 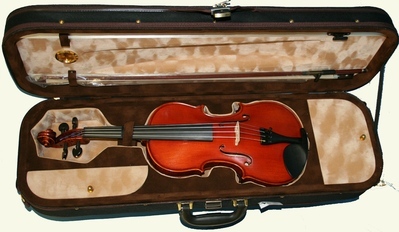 Fitted with Corelli Crystal Strings and supplied with a good quality case, a rosin and a good Brazilwood Bow. A nice sounding violin at a very competitive price. Hidersine Veracini Plus violin outfit. Good quality improver violin made even better by careful set-up and the use of Dominant strings. Comes with a lightweight oblong case, Brazilwood bow and Hidersine rosin. Suitable up to grade 8 and maybe more. Gliga Gems I - another fine violin from Gliga. Workshop version of the Gems II and made with better quality wood. 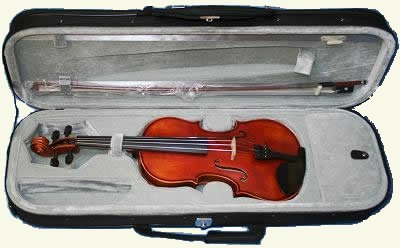 Fitted with Corelli Crystal strings and comes with a good quality case and bow. Like all Gliga violins has a clear and warm tone. 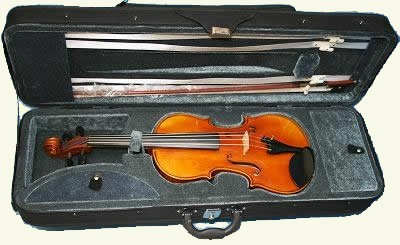 Romanian Student Violin. Made in the same town as the Gliga violins and quite similar in both construction and sound quality. 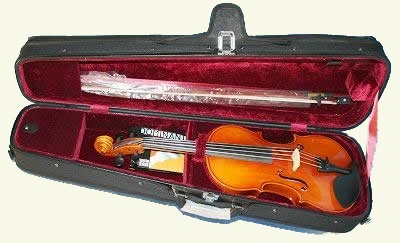 A nice sounding violin fitted with Corelli Crystal strings and comes as a complete outfit with violin, case, bow and rosin. Young Master a new Violin from Eastman Strings. High quality hand carved and exquisitely antiqued. 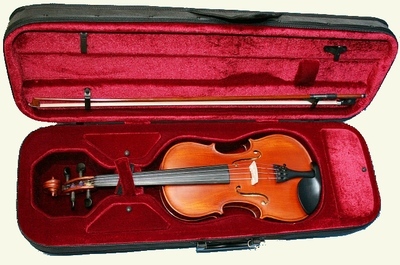 A violin intended for the serious student or amateur Orchestral player. Fitted with Dominant strings this is a really nice instrument to own and play. N.B. This is for the Violin Only. 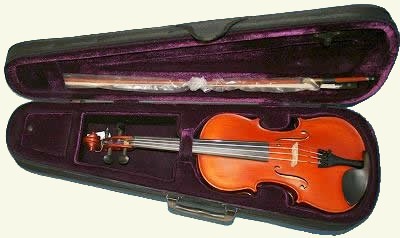 Gliga Gama violin, one of the "Professional" violins from Gliga of Romania. Superior tonewoods and construction. A quality violin both in appearance and sound. Suitable for students of all abilities and for a second violin for Orchestral players.